Blaze of Glory is a relatively clutter free game. There are only a few extra components required to play, the first being a deck of appropriate Activation Cards. Activation cards are a key part of the game, they are the feature that keeps the players guessing and ensuring that the game is never predictable. To start with we just used standard playing cards allocating specific cards to certain figures. After a while, when we had decided that the game worked, I made a set of cards with individual pictures matching each figure in our collection. 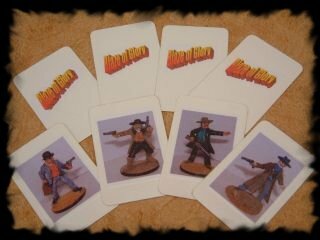 I made four cards for each figure, which will allow any figure to be a Level Four character if necessary. Each card features a photo of the figure in question (oh the wonders of digital technology). I was originally going to put names on the cards but decided that this would limit their uses. The cards are blank playing cards which I have put a B/O/G logo on one side and the picture on the other. It would be possible to use regular playing cards and just cover the original surface with a picture. The other component we required was a way of representing dead figures. In most wargames, figures that are ‘killed’ are removed from play, but in Blaze of Glory it is important to record where your friends met their end as this affects NERVE tests. Some companies, such as Dixon, make casualty figures, which make ideal counters, especially if they were just painted to represent the different sides in play. I decided that initially the expense of buying a dozen or more casualties was not necessary. My dead counters are gravestones, which are placed where a character dies. They are usually kept on a hill in one corner of the table, when a character dies I swap the figure for a gravestone. 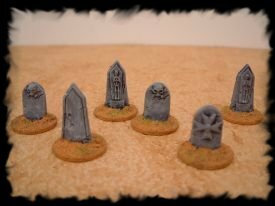 The gravestones are from the plastic skeleton and zombie sprues from Games Workshop , stuck to penny pieces. I used Workshop ones because I had loads knocking around, but many companies make them and if I had the time I probably could have made them myself.